DJ Geribo has always loved and cared for animals. As a child, she once rescued a young pigeon from the sharp claws of a neighborhood cat. Throughout her childhood and into adulthood DJ had almost every kind of small animal you can have as a pet when you live in the city; turtles, fish, gerbils, cats, dogs, birds, and lizards. Her parents never denied her and her siblings any small pet they wanted and the only thing preventing them from having a dog for so many years was a landlord who didn’t allow them. But they even broke that rule and got a small fox terrier mix who lived with them for more than a dozen years until her death. DJ now has three of her own dogs and a Cockatoo. She has also dreamed about building a barn to house farm and rescued animals to add to her menagerie. Fortunately, she found a man, her husband Jim, who loves animals almost as much as she does – this was a prerequisite – must love animals. About ten years ago, she discovered fine art painting and hasn’t looked back, leaving a high tech career to pursue painting full time. It has been DJ’s goal to combine her love for artistic expression with her love of animals and she has spent a decade trying to combine her two passions. Supporting many animal charities by sending the standard yearly renewal amount has been a weak substitute for the strong feelings DJ feels for all animals. She has spent more hours than she can recount looking for a way to combine her two passions. And then it happened. DJ was at an art store in New Hampshire where she lives and she saw a box of tiny canvases – each 2” x 2” in size. She bought several of them wondering at the same time what on earth she could paint on such a small canvas. DJ's very next thought was that she couldn’t paint much more than an eye on this tiny canvas… and DJ Geribo's mini paintings of animal eyes was born. There was never a question that she was going to paint animal eyes. Her first eye was the Tiger. Her first collection features 21 wild animal eyes. DJ is now working on a second collection of wild animal eyes. Two passions – her love of animals with her love of art – together at last! 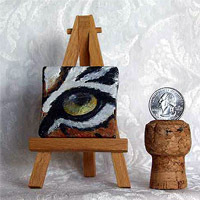 As DJ painted more and more animal eyes, she and her husband, Jim, developed a plan where they could help animals by reproducing the eyes on collector pins and other items. They would send a percentage of the sales to various organizations that cared for and supported animals around the world. Since Jim has his own Web Design business, Positively Creative Solutions, where he performs many duties as an internet architect, designing a website was the least of their problems. The name, EyeHelpAnimals.com, came to DJ when she and Jim were brainstorming, searching for the right name for their new, exciting website. Through this site they are able to tell the world about their passions, their mission, and how others can help, too.